I read this article and found it very interesting, thought it might be something for you. The article is called The Blame Game: 10 Questions for Positive Action and is located at https://teamperformanceus.com/2015/05/the-blame-game/. Sound familiar? 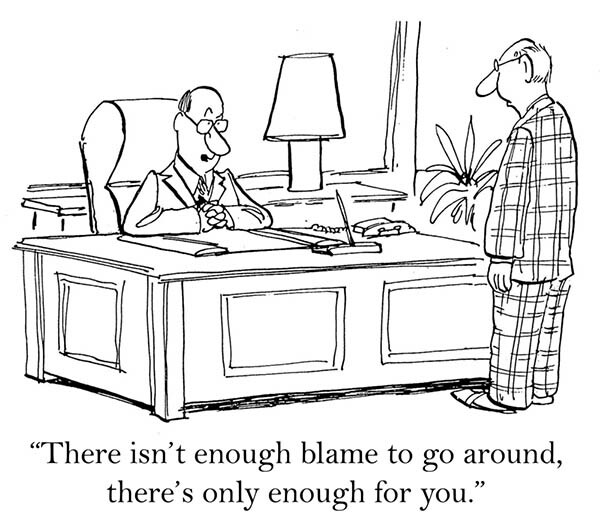 What is blame costing your organization in terms of lost productivity, workplace happiness and organizational growth? Research supports the notion that effective and ineffective behaviors begin at the top. It is crazy to expect employees to do something different than what the leadership team does or permits. Through experience, I have learned that people and organizations stand for what they tolerate and accept as true. If you believe that you will attract and retain the best talent then you will create it. On the other hand, if you tolerate “C” players then you will stand for and thus create “C” players. It is important as a leader and organization as a whole to maintain clear, high expectations, backed by the belief that there are very few factors outside of our control when it comes to building a successful workplace. It takes reflection and work to make it happen. What behaviors contribute to finger pointing and blame? How can I become more awake and aware when I go into blame mode? What do I need to do to personally to evolve and grow as a leader? What does our leadership team need to do to evolve and grow? What is the most effective way to grow people? Who do we need to be as a leadership team to attract “A” players? How can we be more accountable for creating a culture that brings out the best in people? What new beliefs would we like to implement to be more expansive in your thinking? One of the most important things an organization can do to stop the blame is to take a look in the mirror and examine the culture. Companies measure productivity, customer service, and financial results. Take a leap to a new level of accountability-measure your organization’s trust, culture and leadership effectiveness. It is time to become more awake and aware to our impact. Think about how happy everyone would be to have an open and trusting workplace that brings out the best in others. Imagine the possibilities!